Sir William Dugdale, in his “Antiquities of Warwickshire” published in 1651, recounts that Bishop Vesey built fifty-one stone houses in Sutton Coldfield. “And for the prevention of robberies”, says Dugdale, “which were in those days frequent upon the road across Bassetts Heath (leading from Lichfield to London) he erected a house…in a kind of desert place near Canwell Gate, wherein he placed one of his own domestic servants to reside…” This house still exists, forming part of Vesey Grange in Weeford Road. Built in the 1520s and 30s, the stone houses with their massive chimneys and spiral staircases were a big improvement on the vernacular houses of the day, single-storey halls with an open fire in the centre of the room and louvres in the thatched roof to allow the smoke to escape. However, in the next hundred years many timber-framed houses were built to a better design, more practical and comfortable, and most of the stone houses were abandoned. A few of the stone houses were modernised with new wings and extensions, but many of them became the humble cottages of labouring men, or were even used as barns and stables. The house in Weeford Road became a labourer’s cottage, and over time three more simple brick-built cottages were added to it to make a row of four cottages - the same thing happened at another Vesey house, High Heath Cottage. A survey of 1824 shows that the property belonged to Sir Robert Lawley of Canwell Hall, the three-quarter acre plot being divided into four tenements and gardens, occupied by Thomas Broughton, John Brown, William Heney and Robert Houghton. 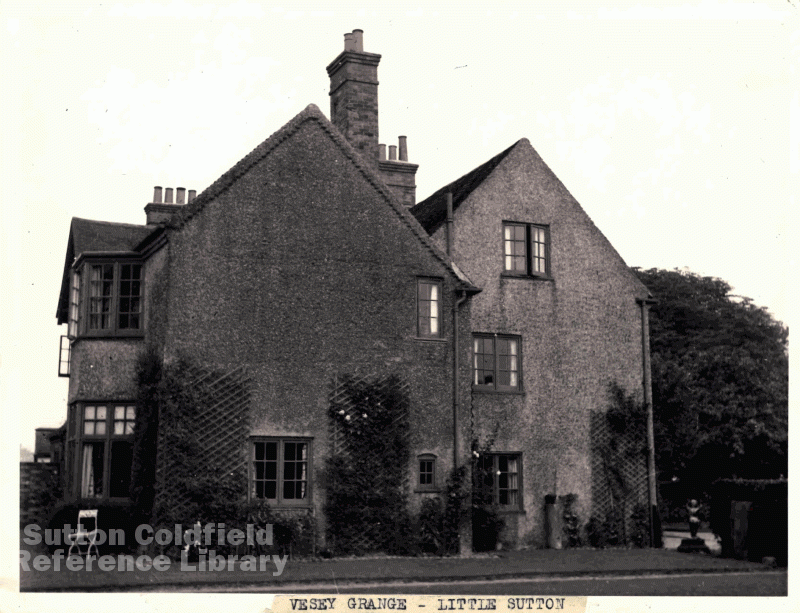 Another survey of 1856 shows that ownership had changed to the Warden and Society of Sutton Coldfield, and although three of the cottages and gardens were occupied, the fourth was uninhabited, rented by a local farmer and described as a yard with barns, a stable and a pigsty. By 1880 the property again consisted of a row of four cottages, and in 1901 there were four households living there, headed by a stockman working on a local farm, two stonebreakers employed on maintaining the roads, and a carter. But fashions were changing, and wealthy men were seeking historic buildings to convert into comfortable homes rather than build on new sites. The old stone house in Weeford Road was extended at the back with a new range of building, the adjoining cottages were converted to house more rooms, a coach house and stables. The 1911 census gives Charles Keith Lloyd, a gentleman of means, living at “Vesey Grange” with his family and servants. Vesey Grange is an English Heritage listed building, grade II*, listed in August 1976 as one of the Bishop Vesey cottages. The stone walls were covered in rough-cast when it was renovated in the 1900s, but some experts suggest that all the stone houses may originally have had a rendering of mortar.